Lines and symbols on the road are meant to show the alignment of the roads. Ideally these are reflective so that you may clearly and safely follow the roads even at night. Road markings also indicate the number of lanes on the road, where you may overtake other vehicles, which lane to use for turning, and where you must stop for signs or other traffic signals. ​Road markings are basically of four major typeszcenter lines, edge lines, cross walks and pavement messages. ​These are lines in the center of the road to separate traffic proceeding in opposite directions. 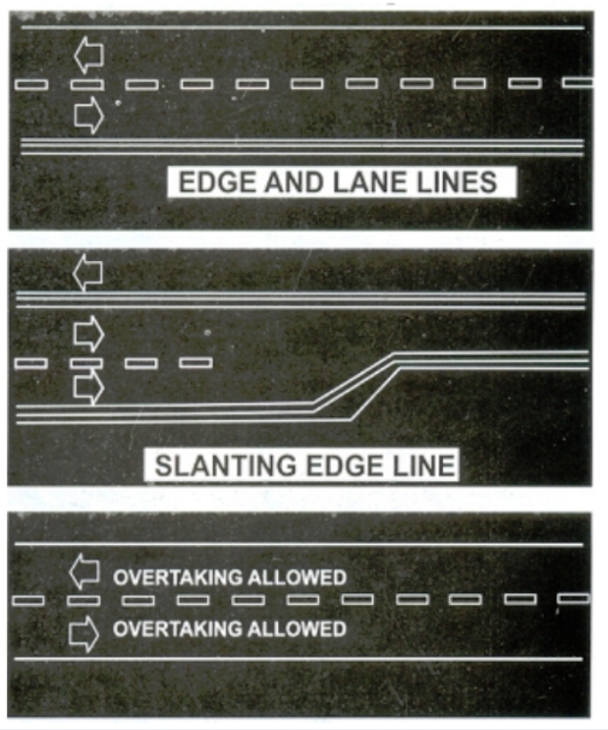 Broken lines are used in areas where there are no restrictions on overtaking In areas where are no restrictions on overtaking, a solid line is painted alongside the broken line. Vou may not overtake if the solid line is on your side of the center line. 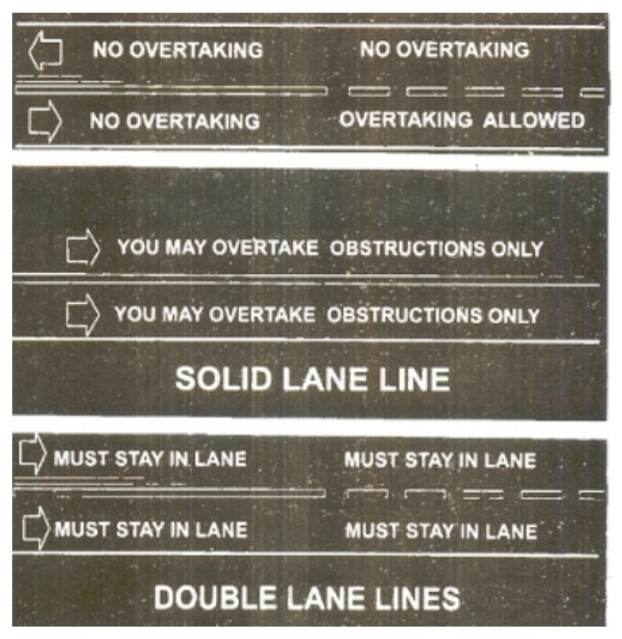 Overtaking for traffic in both directions is strictly forbidden where the center is marked by double solid lines. REMEMBER: Do not overtake unless you can see the road ahead is clear Edge lines: These are solid lines along the side of the road. They indicate where the edge Is and can be used also as traffic guidance. Edge lines: These are solid lines along the side of the road. They indicate where the edge Is and can be used also as traffic guidance. An edge line which slants towards the centre of the road forewarns that the road is narrowed ahead. An edge line may be crossed only by traffic moving to and from the shoulder of the road. White solid lines across the road are usually used to denote pedestrian's crosswalks commonly at intersections Vou must stop for pedestrians at cross walks. A solid white line across the road, usually at intersection, show where you MUST stop for a GIVE WAV sign STOP sign or for red traffic light signal. These are messages or symbols which are lettered or painted on the roads pavement to warn of conditions ahead. These are painted on the road for protection, to separate traffic or to prevent traffic from turning left. ​Do not drive on these areas if you can avoid doing so. These are used to indicate where pedestrians can cross the roads. Vou must stop for pedestrians that have stepped on the lines. ​In traffic queues leaves pedestrian crossing clear. 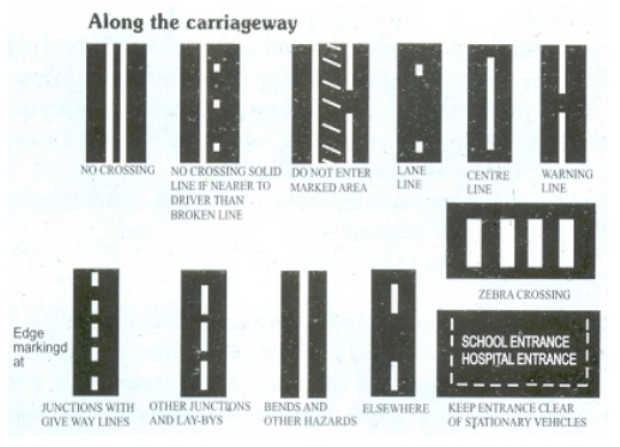 These are spaces on the road demarcated by lines to guide traffic flow moving in the same or opposite direction. For traffic in the same direction the lines are normally yellowt Lines separating traffic moving in opposite directions are usually white. The lines may be broken or solid, indicating whether or not they may be crossed. Usually broken lines may be crossed while solid lines are not expected to be crossed,. ​REMEMBER: some roads do not have any marking. yet the lanes exist. The lanes and lines are easily assessed by the road user. Look with your eyes and see with your mind. Keep between the traffic lane markings. Stay on the right-hand lane unless you are ready to overtake, to turn left or pass parked vehicles. Do not wander unnecessarily from lane to lane. If you need to move into another lane, firsr use your mirror, if ifs safe to move over, signal before doing so. Making sure you will not force another driver to swerve or slow down. Where there is a traffic island on the road. pass on the right of it unless signs or road markings indicate otherwise. ​When coming to junctions, obey the lane indication arrows marked on the road. In a traffic hold”up or so called "traffic jams" do not try to "jump the queue by the cutting into another lane or unauthorized use of siren by overtaking the vehicles waiting in front of you. Although green light means you may go, do not go forward if other vehicles ahead are held at a junction. It is pointless. as you will only contribute towards a solid jam. When the red and amber lights are showing together, you must stop. It is an offence to pass a junction when the red and amber lights are shown. Make sure you stop at a distance to see the lights or before the double lines across the road. Never drive "nose to tail' over any level crossing. Never drive on to one unless you can see that the road is clear on the rail and on the other side. Never stop on or immediately after any level crossing. Some level crossings have gates, or barriers that are operated automatically or by attendant. Some also have flashing red warning lights. Do not cross the railway once the lights have started to flash or when the gates are being closed. At level crossing with no gates, or attendants or warning light, you must stop, look both ways, listen, and make sure there is no train coming before you cross. Some level crossings without gates or attendant have flashing red("stop light"). When the red lights flash, you must stop and wait. Do not cross the railway as train will reach the crossing soon after the lights begin to flash, The lights will go off when it is safe to cross. SECOND: Listen carefully for the approach of railway traffic, try and push the vehicle clear of the crossing and stand well clear of the crossing. THIRD: If the above attempt proves impossible, making phone call or get in contact with the Signalman. If you are already crossing when the red light comes on/ļ¬‚ashes and bell starts ringing, keep going. The lives of highway construction workers depend on drivers who are expected to obey speed limits in work zones. If you are convicted of exceeding the speed limit in a highway work zone, the penalty carries heavy fine. Do not forget, the color orange marks a work zone and means slow down, Vou would also see this sign "SLOW, MEN AT WORK" at such places. Flaggers show signs to drivers in work zone areas They wear orange or yellow vest, yellow - green shirt or jacket. ​They use "STOP/SHOW" paddles/red flag to direct motorists and to let workers or construction vehicle to cross the road. Slow moving vehicles on a single carriage away must ensure that four or more vehicles do not queue behind them. They should move over immediately they notice this as failure to move over carries a heavy penalty. On a dual carriageway, failure to move over to the slow lane for all categories of vehicles constitutes an offence.